[SatNews] Funding cuts triggered by the 2011 Budget Control Act have negatively impacted Navy and Marine Corps readiness, leaving sailors and Marines inadequately prepared to fight and increasing the dangers to them if they do, the chief of naval operations told Congress. 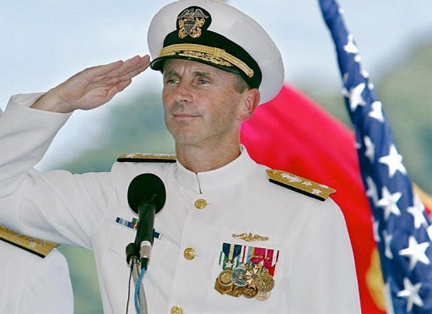 Chief of Naval Operations, Admiral Jonathan W. Greenert. “This means longer timelines to arrive, less time to prevail, if we do, more ships and aircraft out of action when in battle, more sailors, Marines and merchant mariners killed,” Navy Adm. Jonathan W. Greenert told the House Appropriations Committee as lawmakers took up the Pentagon’s $534 billion base budget request for fiscal year 2016. Greenert, along with Navy Secretary Ray Mabus, described the sequester-caused damage to readiness and warned of what could occur if it returns in the coming fiscal year. The Navy’s top uniformed officer said the administration’s 2016 budget request—which proposes defense spending above sequester limits—“represents the absolute minimum funding levels needed to execute our strategic guidance.” Any further cuts, he said, would damage national security. Also testifying was Marine Corps Commandant Gen. Joseph F. Dunford Jr., who described his service as having to make tough choices to deal with the effects of years of war in Iraq and Afghanistan in addition to reduced budgets. 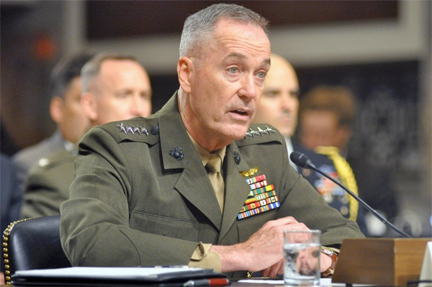 “As a result,” Dunford said, “approximately half of our non-deployed units—and those are the ones that provide the bench to respond to unforeseen contingencies—are suffering personnel, equipment and training shortfalls.” This situation, he added, will delay response times and put American lives at risk unnecessarily. “Perhaps more concerning, it will result in fewer Marines and sailors being forward-deployed and in a position to immediately respond to a crisis involving diplomatic posts, American citizens or U.S. interests,” Dunford said. The effects of the automatic across-the-board cuts known as the sequester—imposed after the White House and Congress failed in 2011 to agree on a plan to reduce the budget deficit—were mitigated by legislation last year that restored some military spending, but without congressional action, the sequester law is set to take effect again October 1st.